Gnome For The Holidays [G1830] - $12.00 : Yarn Tree, Your wholesale source for cross stitch supplies. Cross stitch pattern from Tiny Modernist. Dressed for Christmas, these five gnomes are coming home for the holidays! The first gnome is carrying a lantern in one hand & a Christmas present in the other. He is help guiding the way! The second gnome is carrying a blue present with a yellow bow. What could be inside? The third gnome is carrying a candy cane. He has dessert covered! The fourth gnome is carrying a red swirl lollipop! Hope he doesn't eat it before he gets home. The fifth gnome is carrying a red & yellow present with a blue bow. Special delivery is on it's way! 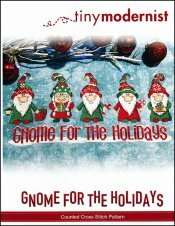 This is "Gnome For The Holidays!" Stitch count is 79h x 184w.